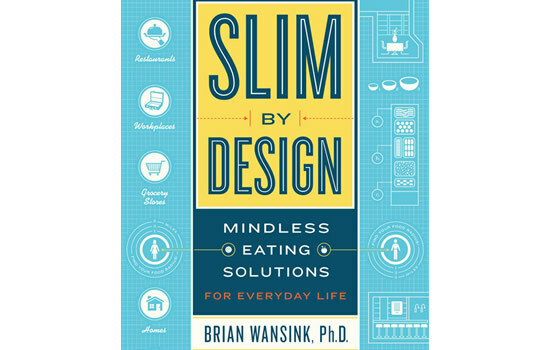 Slim By Design is from Brian Wansink, an award-winning scientific researcher and best-selling author on the subject of changing eating behaviors. He is also the pioneer of the “Small Plate Movement”. This initiative helps people lose weight simply by reducing the size of their dinnerware. In Slim by Design he shares his scientific approach to dieting and offers information to help readers make better food choices. It focuses on redesigning our surroundings in a way that makes it easy to stay lean and healthy. Slim by Design asserts that the answer to weight loss isn’t telling people what to eat or how to live. The key is to set up their living environment so that weight loss will occur naturally. Using the latest cutting-edge research the author demonstrates how simple changes can make it easier for people to eat healthier. Taking small actions can produce noticeable results that lead to effortless weight loss and better health. Gradually we’ve designed our homes to make it simple to find and eat the foods we enjoy. Restaurants, grocery stores, workplaces and schools have also made it easier for people to access their favorite treats. Unfortunately these changes have made us “fat by design”. Slim By Design encourages readers to reverse this trend by overhauling the home to make it easier to eat healthfully. At the same time you are encouraged to reach out to the places in their community and ask for assistance. For each location or zone – such as a restaurant or workplace – there is a 10-point scorecard. The initial score will give you an idea whether these places are supporting or sabotaging your ability to choose healthy foods. 2) Let them know how they could help you eat less and eat better. If you find areas that can be improved you are encouraged to contact them directly to request changes. Resources are provided to give you ideas on how to get started and what to ask. Hang vibrant posters that encourage children to choose healthy options. Place a bowl of fresh fruit next to the cash register. Give vegetables dishes an interesting name. Provide half-sized portions to help people eat less (and increase their profits simultaneously). Encourage customers to take uneaten food home with them. Offer a double vegetable option in place of starches. Make available a dessert consisting of fruit-only. Provide low-calorie dressings and sauces. Provide a candy-free checkout aisle. Promote healthy foods on the end-aisle displays. Put the healthiest items in aisles 1, 2 and 3. Display fresh produce in a more attractive way. Serve salad and vegetables at the beginning of the meal. Eat meals at a table with the television turned off. Pre-cut fruit and veggies and put them on the middle shelf of the fridge. Keep at least six serves of lean protein in the fridge. All other snack foods are kept in one inconvenient cupboard. The only food on the countertop should be a bowl of fruit. Provide healthy and convenient combo-lunches in the cafeteria. Offer an attractive break room for workers who choose to bring their own lunches. Encourage CEO’s to introduce a company wellness plan. Slim by Design: Mindless Eating Solutions for Everyday Life retails at $26.99. Focuses on creating a living environment that makes it easier for people to make healthful food choices. Based on the latest scientific research, which has verified positive outcomes. Includes resources to help readers create beneficial changes in their living and eating spaces. Helps people get healthier and lose weight without having to follow a specific diet. Is not an actual weight loss plan but more of a lifestyle guide. Some people may require more personalized guidance to achieve their desired outcomes. Advocates the use of diet soda, which has been associated with negative health effects. Slim by Design offers practical ways to change your living spaces so you will naturally make better food choices. It will be easier for you and your family to eat more healthfully: whether at home, the grocery store, in restaurants, at work, or at school. Wansink, B. (2014). Slim by Design. HarperCollins.